​Welcome the the blog of Zelda Sheldon. There's so much amazing stuff going on around me and most of it flies by with hardly a second thought. I love what I can learn from nature and design, creativity and passion. Here is where I write and comment as I try to make sense of the world. A non-religious wedding officiant in Nashville. A non-denominational wedding officiant in Nashville. That’s exactly what some planning to get married are searching for. And the reason is simply because not everyone wants a church wedding. And not everyone wants to be married by clerk simply signing the marriage certificate. Is there a middle ground? Is there a simple ceremony that is not religious? Is there a way that is more than just a legal transaction? Yes, most certainly there is. However, couples looking for a Non-religious or Non-denominational wedding Officiant are finding the task quite a challenge. According to quite a few couples who’ve reached out to me, the religious ministers they called refused to officiate their wedding simply because that couple did not attend a church. So how do couples that want to be married but are not churchgoers find a wedding officiant who can help them get married? A simple non-religious and non-denominational wedding? Yes there is, and that’s why couples look for a wedding officiant who offers non-religious and non-denominational wedding officiating services. Non-religious and non-denominational does not mean it’s non meaningful, or beautiful or special. The wedding ceremony can be completely tailor-made to be a perfect match to the couple’s style and preferences. As a Nashville wedding officiant I speak from personal experience officiating over 85 weddings since 2013. These days a couple can choose the exact style of wedding they want. Some want a big extravagant event where all their friends and family join them. Others want the complete opposite and want to elope and so they request an elopement wedding just to two of them. One of my couples I officiated who eloped actually had just the three of them – because their devoted Cavalier King Charles spaniel was their only witness. And a truly special new-years eve elopement ceremony it was. As far as locations go, I’ve officiated indoors and outdoors, in parks, in fields, in farms, on bridges, by rivers, on boats, in restaurants, in event spaces, in concert halls, in churches, in gardens, in my own back garden, on balconies and decks, in public places and private back yards and homes, even inside a jail, with just the couple, the chaplain and me. And it may seem strange to hear but that was just as romantic a setting as I’ve ever experienced. As a wedding officiant it’s my absolute pleasure and honor to help couples declare their love with vows of marriage in whatever style they choose. And if a non-religious wedding is your style, and a non-denomination wedding your preferred way to be married then let’s make that happen. A simple, fast and elegant wedding anyone? It's the simple and beautiful wedding many have been waiting for and it can be your way too. Reach out to me via the contact form at the top of the website or text me at 615 720 7192. 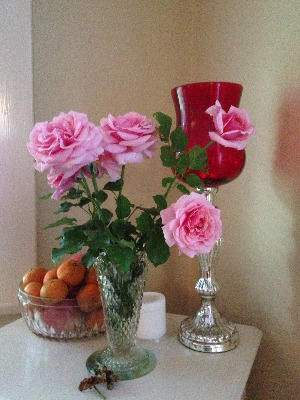 Perfect pink roses from our Nashville garden. Pink roses from our garden in Nashville. Thanks to Pal my hubby's pruning our rose bush in our front yard grew dozens of perfect pink roses. Pal snipped some for inside. One thing about flowers. They don't last that long. You have to appreciate them while they are here because they have so little time to be in full bloom. I'm thinking about how lucky we are to have all these beautiful roses around our house. It was all due to someone else's planting and caring. Year after year. And we just rocked up when we purchased the house and there they are, growing and flowering. Nothing lasts forever though. The seasons come and we go. The cycle of life. I'm alive. I'm growing. If I was a rose bush I'd be called a mature rose bush. I've been around for years and with an annual pruning I'm still blooming. Life is so busy. And there is so little time. I'm in the season of full bloom right now. And these roses remind me that there is so little time to stop and smell the roses. Spring! A time to bloom! ​Zelda Sheldon, living the dream, one day at a time in Nashville Tennessee.